Aaron Finch(c), Nathan Coulter-Nile, Chris Lynn, Alex Carey, Glenn Maxwell, Ben McDermott, D Arcy Short, Marcus Stoinis, Andrew Tye, Adam Zampa, Billy Stanlake. Chris Lynn, Aaron Finch(c), Ben McDermott, Nathan Coulter-Nile, Alex Carey, Ashton Agar, Marcus Stoinis, Andrew Tye, Glenn Maxwell, D Arcy Short, Adam Zampa, Jason Behrendorff, Billy Stanlake. Virat Kohli(c), Lokesh Rahul, Shikhar Dhawan, Rohit Sharma, Rishabh Pant, Kuldeep Yadav, Yuzvendra Chahal, Krunal Pandya ,Dinesh Karthik, Jasprit Bumrah, K Khaleel Ahmed, Bhuvneshwar Kumar. Dinesh Karthik(w), Virat Kohli(c), Lokesh Rahul, Shreyas Iyer, Manish Pandey, , Rishabh Pant, Washington Sundar, Krunal Pandya, Bhuvneshwar Kumar, Jasprit Bumrah, Umesh Yadav, K Khaleel Ahmed, Shikhar Dhawan, Kuldeep Yadav, Rohit Sharma, Yuzvendra Chahal. 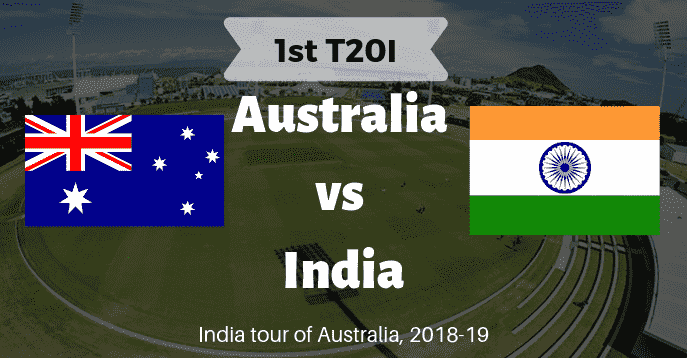 All the details of AUS vs IND Dream11 1st T20I Match Prediction & Playing 11 will be updated shortly. Stay tuned and subscribe to our notification and like our facebook page to get latest and real time updates.